The Nite Ize booth at Global Pet Expo 2013 completely captured Mom's eyes. She's a sucker for pretty colored lights. BOL!! I barked at her to remind her that we were there to look at dog stuff. BOL!! 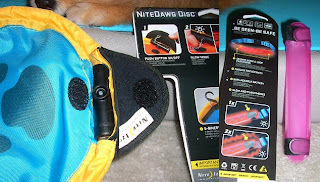 My pal Oz had reviewed the Nite Dawg LED Dog Collar, so I knew they made LED dog collars. 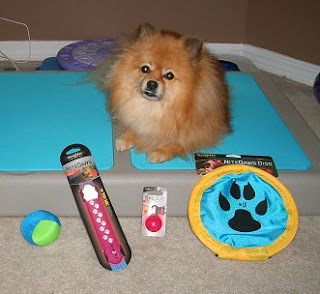 I discovered they make several pawsome products for dogs. Mom noticed an interesting item that she had to have a closer look at. 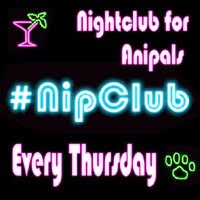 It was the the Nite Dawg LED Collar Cover. Naturally, I insisted she get a pink one for me. 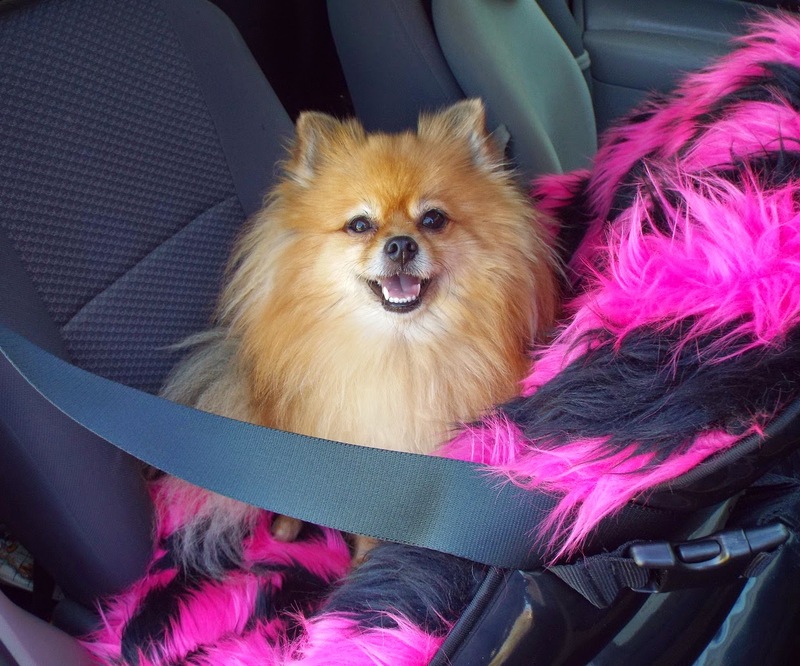 It is flexible and can fit in a purse, poop bag dispenser, treat pouch, or pocket. When it gets dark, it is easy to attach it to your collar (or leash) using the Velcro closures. I usually choose to attach mine to my leash. It is great for when you want to add light to your favorite collar. 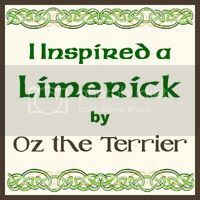 I was excited to see that Nite Ize also makes LED dog toys! You know these were my favorite items in the booth! BOL!!! They told us how much my pal Kona enjoyed the Nite Dawg LED Soft Disc, so of course I had to have one too! BOL!! It has a red LED light tube inside the yellow edge. It has two settings for the light: steady, or flashing. 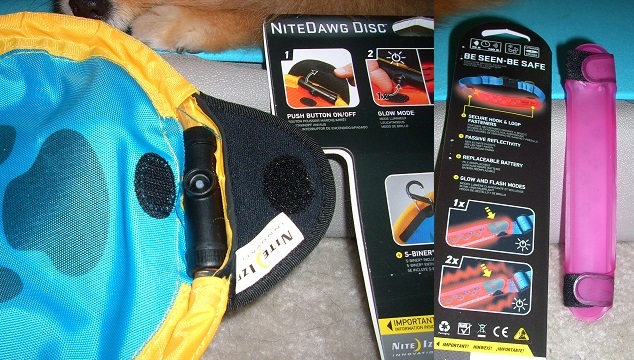 The Nite Dawg LED Soft Disc has a Velcro closure to cover the on/off /flash button. I really like that the disc is blue and yellow, because these are the 2 colors that dogs can see. The bright colors make it a fun toy to fetch in daytime as well. Pawsonally, I like to play tug with it too! BOL!! There is an included S clip that can be used to hook the disc to a belt loop. I have a fun Astrobrite LED Bean Ball that is soft and smushy! It has a pocket that holds a green colored SpotLit LED light. It makes the ball glow green. Safety note: The soft ball I have is not a pet product; it is a human toy. It is filled with beads, so it isn't suitable for dogs who eat their toys. I do not destroy my toys, so I can play with it. Nite Ize makes the furrific rubber Meteorlight K-9 Ball for dogs. It is the size of a tennis ball. 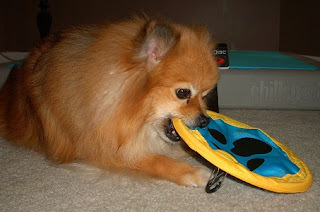 My mouth is too small to grab it, that is why I chose the soft Astrobrite LED Bean Ball designed for humans. Nite Ize makes another great product - the SpotLit LED Collar Light (large size - steady or flashing), and the PetLit LED Collar Light (small size - steady) to hang on your collar. They come in different colors too! Of course I chose pink! BOL!!! I have the big one attached to my harness, and the small one is on my collar. 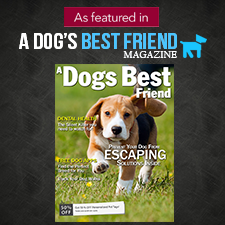 The big SpotLit LED Collar Light is brighter than the small PetLit Collar Light. Do you have any fun light up toys? Do you wear a lighted collar, leash, or collar light for nighttime walks? Daddy takes us out on the night shift, so mommy will ask if he'd like to light us up! Mommy thinks this is a great idea! Pepper this information about the lighted collars for dogs is really great for people that take their dogs for walks at night unfortunately we do not walk at night. However, that was nice to know they have the toys that light up. Great job Pepper. Lots of cool stuff! We don't have any light-up toys but we do have light up collars. But I really yours because it is pink! Happy Earth Day! woo woo woo! We like Nite Ize. We use the Spot Lit on dark winter walks.